Baltimore, MD—The Ehlers-Danlos Society hosted their annual Global Learning Conference in Baltimore last week, bringing together more than 600 patients, families, caregivers, and health professionals for four days of education, advocacy, and support. The conference kicked off on Thursday afternoon with Professor Anne De Paepe of Ghent University delivering the keynote speech on the History of EDS Genetics. “The 2017 Criteria shows how much the concept of EDS has evolved–and that EDS is not only directly linked to collagen, but many other connective tissue defects.” – Prof. Anne De Paepe. Conference attendees had the opportunity to learn directly from nearly three-dozen world-renowned experts in the Ehlers-Danlos syndromes and related disorders. Throughout Thursday, Friday, and Saturday, a total of twenty-eight speakers delivered powerful, informative presentations on topics ranging from dysautonomia and mast cell activation syndrome to neurology—and from building a coordinated medical team to managing pain with medical cannabis. Meanwhile, the Junior Zebras program hosted nearly twenty children living with EDS and HSD. Ranging in age from 5 to 17-years-old, the Global Learning Conference represented, for many, the first time to socialize with others living with their conditions. “In addition to specially tailored educational presentations and discussion groups with physicians and other health professionals, we worked to provide our Junior Zebras with social, emotional, and physical activities to help them become well-educated, positive, and energetic advocates for their own health—and the health and well-being of others living with EDS, HSD, and the myriad symptoms and comorbidities they and their families may face,” states Shani Weber, Junior Zebra Co-Leader and The Ehlers-Danlos Society’s Patient and Community Advisor. “From our scavenger hunt to the development of an awareness video featuring their feelings about EDS, HSD, and how it impacts their lives, we tried to engage and support the emotional, social, and physical challenges each Junior Zebra confronts each day with knowledge, confidence, and the good humor, necessary to thrive, despite the individual and collective challenges they face,” adds Junior Zebra Co-Leader and Volunteer Coordinator Sarah Jo Ritchie. The Junior Zebras program came to a dazzling conclusion with a special performance of their moving and original song, “Skin and Bones.” Written in collaboration with London-based singer Christina Bloom, the Society’s youngest members learned the power of creative collaboration and expression as positive way of working through and communicating the challenges of living with EDS/HSD. “Ultimately, our Junior Zebras inspired hundreds with their open and honest collective voice. They exemplified the ideal of dazzling together,” adds Weber. Ehlers-Danlos activist Christina Doherty, aka @watercolor_me_impressed, was recognized at the Zebra Ball for her accomplishments as an Ehlers-Danlos advocate during May Awareness Instagram contest. Linda Neumann-Potash was honored with the first-ever Nancy Rogowski Award for dedication to our cause. Linda was diagnosed with Hypermobile EDS in 1985 and has spent the last 30 years advocating for those affected by EDS and their families. Linda served as the Executive Director of The Ehlers-Danlos National Foundation from 1996 to 2003. She also served on the Board of Directors from 1991 to 1995—and rejoined the board in recent years. “Linda has been tireless in her devotion to The Ehlers-Danlos Society. As a leader, advocate, and fundraiser, Linda’s counsel and contributions to the Society have inspired others and helped to ensure our growth over the past three decades—and we are grateful for her service, strength, and hope,” states US Executive Director, Shane Robinson. As part of The Ehlers-Danlos Society’s growing commitment to advance research, education, advocacy, and support, for all of those living with EDS, Saturday’s lunch also featured special guest speaker Chrystal Nichols, who spoke of the unique challenges of living with vascular EDS, which is both one of the rarer types, and the most life-threatening of all the fourteen types of EDS. In sharing the stories of losing both her brother and mother to vEDS, and how her experiences have ignited a passion for Ehlers-Danlos advocacy and activism, Chrystal, a Baltimore native, rallied the audience to channel the excitement and energy of the conference and bring that home with them so that they never stop telling anyone who will listen about EDS. “I look around this room and I see all of these people who could be anywhere on a Saturday, but you chose to be here, to learn more about EDS—and that is so incredibly important. I applaud each and every one of you for being here. Because it is only you, those who live with EDS, who can raise awareness about EDS in your communities,” said Nichols. The legendary Professor Rodney Grahame delivered the last speech of the day on Saturday, discussing his first 50 years as an EDS researcher and clinician. Executive Director Lara Bloom surprised Prof. Grahame with a thank you video from his patients and colleagues for 50 years of EDS research and service to the EDS/HSD patient community—worldwide. “Professor Grahame has fought passionately for our community’s recognition and care for five decades. Without his knowledge, dedication, and compassion, people living with Ehlers-Danlos would have far less hope for the future. Professor Grahame has been nothing less than a true lifesaver in the ever-turbulent waters of chronic and invisible illness,” stated Bloom. 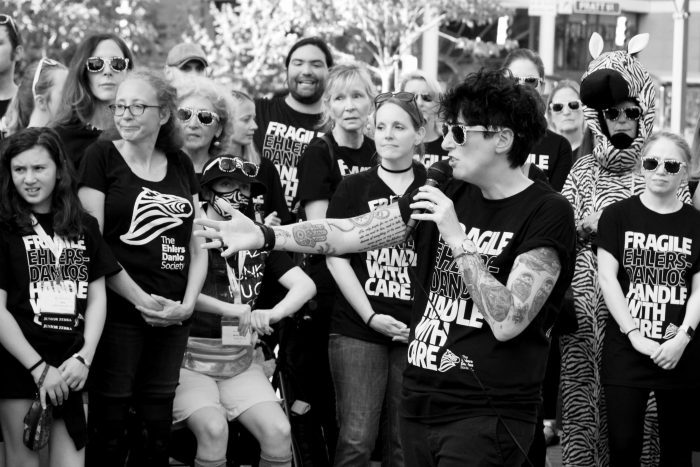 Rounding out the day on Saturday, a “dazzle” of over 350 people living with EDS, and their supporters, marched to Baltimore’s Inner Harbor for the Ehlers-Danlos Society’s Third Annual Zebra Rally at McKeldin Square. Clad almost entirely in black and white “FRAGILE BUT UNBREAKABLE,” EDS awareness t-shirts and zebra stripes, the Society’s EDSers garnered the attention of locals and tourists alike, as they chanted in unison, “Zebra Strong! Zebra Strong!” a rallying cry to all those affected by EDS, HSD—and the seemingly countless symptoms and comorbidities, challenging their daily lives. International Ehlers Danlos Advocate, Motivational Speaker, and Miss Allegany County (Miss America Organization), Victoria Graham—spoke about her experience of living with Ehlers-Danlos syndrome as an invisible illness. Sunday featured two first-ever, stand-alone events: Rarer Types Day and Medical Professionals Day. Rarer Types Day focused on all those living with vascular, classical, or other rare types of the Ehlers-Danlos syndromes. This inaugural event featured specialized presentations focused on living with the rare types of EDS, as well as providing networking opportunities for many who may have never met someone with their rare type. “Medical Professionals Day exemplifies the commitment of the Ehlers-Danlos Society to educate medical professionals on how to treat patients with EDS,” added Bloom. The focus was “All Care is Local: Identifying and Managing EDS in a Clinical Setting,” Continuing medical education (CME) credits were provided to attendees through a partnership with the Greater Baltimore Medical Center (GMBC), home of The Ehlers-Danlos Society Center for Research & Clinical Care.